Toasted Sesame Asian Dressing. It’s so hard to find sesame Asian salad dressing without a lot of sugar and other additives. That is why I make homemade salad dressing. Homemade sesame Asian salad dressing gives you the freedom to add whatever you like, without all the added sugar. Homemade Asian dressings are notorious for adding lots of sugar or high fructose corn syrup. This homemade toasted sesame dressing is packed with flavor and without the sugar. All you need is 3 ingredients and under 5 minutes! The nutty flavor of the toasted sesame oil really makes this Asian Sesame Dressing stand out. This toasted sesame Asian dressing would make a great dip as well. I’m thinking for some pot stickers? I guess I need to make those next! Salads are meant to be healthy. Not loaded with sugar. If you are wanting to make this gluten free, choose the tamari or bragg’s aminos. Both are gluten free. 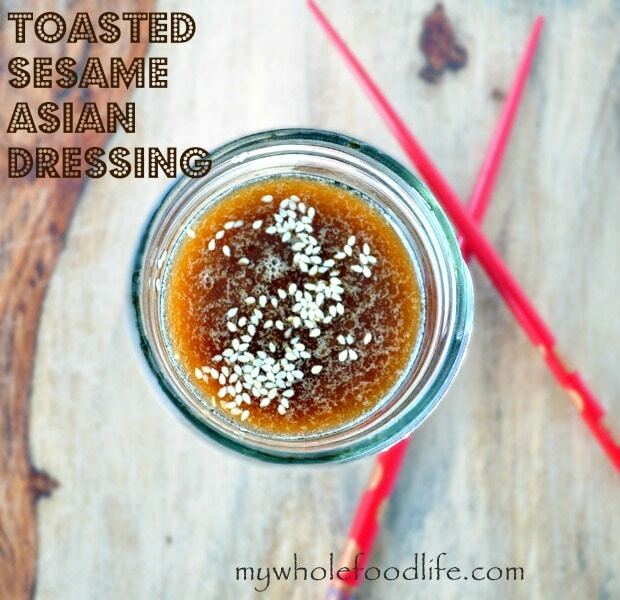 I hope you enjoy this Asian Sesame Dressing as much as we did! Only a few ingredients and just as good as the restaurant! Whisk all ingredients in a small bowl . The dressing should keep for a few weeks in the fridge. If you want to add a hint of sweetness, you can add 1 tsp of mirin or raw honey. This dressing was amazing! I have been searching for an Asian style dressing, but they are so loaded with sugar. This satisfies my craving without it! I didn't have rice vinegar and substituted apple cider vinegar. I used pure sesame oil, apple cider vinegar and coconut aminos in equal parts. Perfection! Sweet and tangy. I'm so glad you liked it Jennifer! Looks fabulous! Can it be used for stitches fry?.